It is one of the most recurrent searches within the sector, everyone wants to know which are the best sunglasses. In this post, we have proposed to add a little light on this topic and help with useful information from our experience. To be able to choose the sunglasses that are on the podium of the best, we have to go into a series of technical and aesthetic aspects. Each goggle may be the best according to its use, design or price segment. Sunglasses are a fundamental pillar for the prevention of visual health problems and for this reason, it is one of the star recommendations that optometrists make in our cabinets. We should all be aware of the role they play in keeping our eyes protected from ultraviolet rays, just as we use a sunscreen to protect our skin when we go to the beach or the mountain. 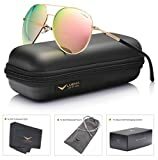 But if I am already clear that I am going to buy some glasses to filter the ultraviolet rays, what added value does a polarized sunglasses give me compared to another that is not? Is it always the best option? 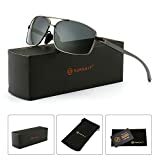 Also in this article, you can access my opinion on 5 of the best-known polarized glasses brands: Hawkers, Polaroid, Rayban, Maui Jim, and Oakley glasses. What are the advantages of polarized sunglasses? 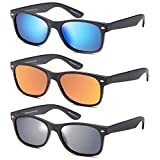 What polarized sunglasses to buy? Do you prefer price? fashion or quality? What are the best sunglasses on the market? 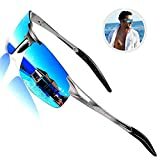 A polarized sunglasses? It is a base sun lens to which a special sheet is added that only blocks the light that comes in a certain direction. 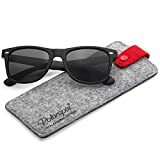 The usual thing is that in the case of sunglasses are vertically polarized so that it will fundamentally block the light that comes horizontally. Starting from the basis that sunlight is not polarized by itself (it vibrates in all directions), glasses can not block it without more but what happens is that when that light is reflected on a horizontal surface (the road; especially if it is wet, water, a crystal, etc …), then the lens does block it. When using polarized sunglasses the glare produced by the sun reflected on the surface is dramatically reduced and improving vision. They are manufactured for both neutral and prescription sunglasses. 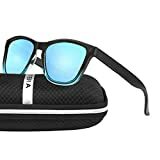 The lenses polarized sunglasses are especially interesting for certain types of outdoor activities such as driving, fishing, water sports, and snow, but also benefit us in many other situations. It can also be seen that the shadow areas do not darken as much as with “normal” sunglasses so that when passing through shaded areas or even tunnels, the vision that is achieved is better. This effect also makes it possible to see better if we look at the bottom of a river on a bright day because it takes away the reflection that the water gives us. So much so that in fishing competitions is strictly prohibited the use of polarized glasses, as they would give a considerable advantage over the other participants to see the bottom fish much better. As a curiosity, I will also tell you that polarized lenses (not sun) are also used in films in three dimensions using sheets positioned in different directions in both eyes. Part of the light reflected from the screen is vertically polarized while another is horizontally polarized. This means that each of the lenses will filter one type of wave and not the others, resulting in the 3-dimensional sensation if the film is projected in that format. The viewer’s brain takes both images and combines them to create a realistic sense of depth. Nowadays, polarized filters of different degrees already exist in the market, so you can choose depending on the use of greater or lesser protection and combine all this with filters and anti-reflective treatments. In my opinion, they are very few but you have to keep them in mind. 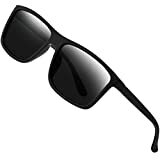 We must bear in mind that the polarized lenses of sunglasses do not offer protection for all glare. If the user tilts his head more than 45 degrees, some horizontal light reflections can enter and cause some bright spots. Some users who use polarized lenses in their sunglasses in snowy areas, notice that they lose some contrast between the snow. This same problem can happen when polarized glasses and devices with LCD screens (computers, navigators, mobile phones) are used because they can distort the images in certain viewing positions and even make the screens look very dark. Once you have the information about them, you must decide if you prefer to invest in high-quality sun polarized glasses or if you prefer to buy some based on fashion and/or price. A type of glasses very common, especially during holidays, are sunglasses. Its use is very popular in people of all ages, although the use is not always the most appropriate. 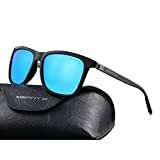 You have to take into account some essential features when buying them and we hope that this guide to buying the best sunglasses will help you when choosing them so that you make a good investment, but above all, to avoid damage to your eyes. The first consideration you should take into account when choosing which sunglasses are better is that they are certified with the CE seal, which guarantees that they meet the minimum standards to provide you, satisfactorily, a vision with maximum eye protection. Ultraviolet or UV rays, are part of the sun’s rays and not only affect the skin, but also the eyes, so, an essential feature for sunglasses is that they have a UV filter. This is a protective layer, made with chemicals called chromophores, which are able to attract energy or light. It is added to the lens material during processing so that it can absorb UV radiation. The adequate UV protection is not determined by the color of the lens, as it tends to be mistakenly believed. Keep this in mind when comparing sunglasses and especially when buying cheap sunglasses, because in the market there are many sunglasses that do not protect your eyes properly and could cause irreversible damage to your retina. Another fundamental aspect is that the lenses have a sunscreen to prevent the rest of the solar radiation from damaging the eye. This filter is determined by the color of the lens and its absorption capacity. Brown is recommended especially for winter sports, in cases of myopia or if artificial light is used since it greatly improves the vision of the contrasts. 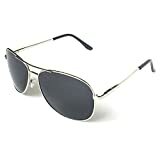 Gray is the best alternative for sunglasses to drive because it does not alter the vision of colors. Green adjusts well to any use since it scarcely alters the perception of color. Yellow is recommended for night driving because it relieves the vision of contrasts.